Whether they are caused by storms, accidents, or a failure in the increasingly overburdened electrical grid, burnouts and power outages are occurring more regularly. However, with a home standby generator, you won't have to worry when the electricity is out because your house will still have power. With models from 7KW - 200KW, our generators meet the needs of any size home or budget. They are quiet, reliable, efficient, and easy to use, featuring automatic startup and shutdown, natural gas, propane or diesel fuel supply, and self-diagnosis. We install and service all makes and models. Why Should I Have My Generator Serviced? The importance of generator maintenance cannot be stressed enough. 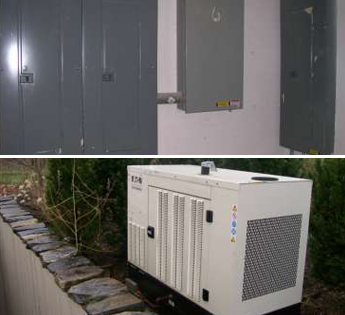 Inclement weather, poor reliability of utility power, and safety require your generator to be in top shape. Through use and over time, batteries, oils, fluids, and belts deteriorate. Regular maintenance is the only way to ensure that your generator will perform when you need it. Preventative maintenance also saves you money. Early detection of small problems can help prevent you from incurring major repair costs. Proper maintenance protects your investment, as well as the property it serves.